Da Couch Tomato: Micro: The Vampire Diaries. Season 5. Episode 8: "Dead Man on Campus"
Who is the Augustine vampire? No idea. More appropriately, what kind of vampire does the Augustine Society try to make? They are vampires who feed on vampires instead of humans. Kind of like Papa Mikelson, right? Hmmm. 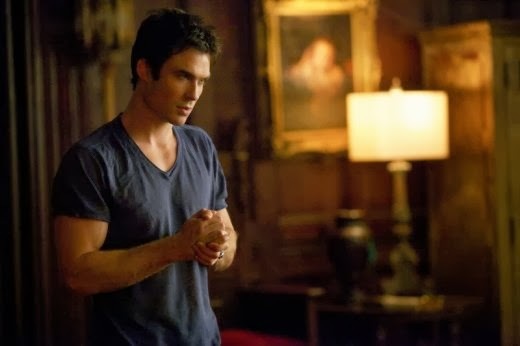 As usual, an outsider love interest's life is short-lived, as Jesse dies in the hands of Elena while saving Damon. Caroline is left without a love interest once again. Bye, Jesse. Caroline, go to New Orleans! Plus, Katheirne and Stefan team up to try to stop each other from wallowing in their own misery. I hope they do not play the lover's card again with these doppelgangers. Really, that's them helping each other.